Many people think or have been told that because they have astigmatism they cannot wear contact lenses. This is not true. We can fit all prescriptions including very high degrees of astigmatism with modern contact lenses. It is a common misconception that when people require different prescriptions for distance and reading vision contact lenses will no longer be suitable for existing wearers or not an option for someone who has never worn contact lenses. There are a large range of contact lens options available for patients who wear bifocals, varifocals or separate distance and reading spectacles. Come and ask our friendly optometrists. Contact lenses can be an invaluable option for people with certain eye conditions that cannot achieve good vision with spectacles. 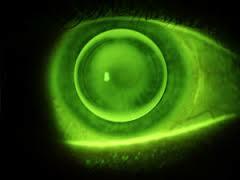 For example, a condition called keratoconus distorts the surface of the eye known as the cornea. This irregular distortion reduces vision such that it cannot be corrected with spectacles. With special, tailor made contact lenses we are able to manage keratoconus so that clear vision is restored. Following significant eye injuries the cornea (the surface of the eye) or the iris (the coloured part of eye) can get damaged. Damage to the cornea can cause distorted vision which may not be correctable with spectacles. Damage to the iris may lead to persistent glare. Contact lenses are often a great management option in these cases improving vision or reducing glare. Eye injuries and certain eye conditions may change the appearance of the eye making it look unsightly. Modern cosmetic contact lenses can help improve the eyes appearance making it closer to normal. If you have any questions regarding our specialist contact lenses service please contact us and we will be happy to help.